Why do investors love small cap stocks? They’re the companies that act like hi-octane fuel in high performance growth portfolios, rewarding investors more handsomely than the big end of town. However, they’re not without their risks. They need to be respected and understood before inclusion in a diversified portfolio. So, what are ‘small caps’? The term ‘cap’ refers to market capitalisation, which is calculated by multiplying the company’s share price by the number of its outstanding shares. You’ll also come across the terms ‘large caps’ and ‘mid caps’. There’s no universally agreed definition of small, medium or large cap companies, yet broadly speaking large caps (those in the S&P/ASX50) have the highest capitalisation value ranging upwards of $10 billion. For example, BHP Billiton (BHP) is valued at ~$103 billion. Mid-caps are the next 50 largest companies with capitalised values between $2 and $10 billion; e.g. Carsales.com Limited (CAR) is ~$3.5 billion. The rest are small caps, such as our ‘Star Growth Stock’ Citadel Group Limited (CGL) which is valued at $313 million. Superior quality small cap stocks are highly prized as they are typically in the earlier stages of their growth cycle. Unlike large organisations, smaller companies are nimble enough to exploit their growth opportunities and, hence, often expand at a faster rate than larger firms. This growth ultimately rewards its investors because, as the company grows, it becomes more valuable. 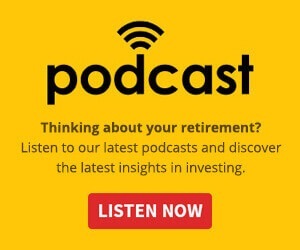 This potential for dynamic growth is why many investors spend hours pouring through the internet and/or newspapers, trying to unearth those ‘hot tips’ that are worthy of a place in their portfolio. Here at Lincoln, we have a passion for small cap stocks and know how to identify which ones represent an opportunity. We do this through the application of our three primary Golden Rules of stock selection. Should a small cap stock meet these rules then, irrespective of its size, you have just identified a quality business. Do not invest without understanding the financial strength of the company. Without this, you are purely speculating as this assessment is an indicator of insolvency risk. For this vital task, we use our Financial Health Model. It’s a proprietary model with a 94% accuracy rating of successfully identifying corporate default/failure, often years before they collapse. 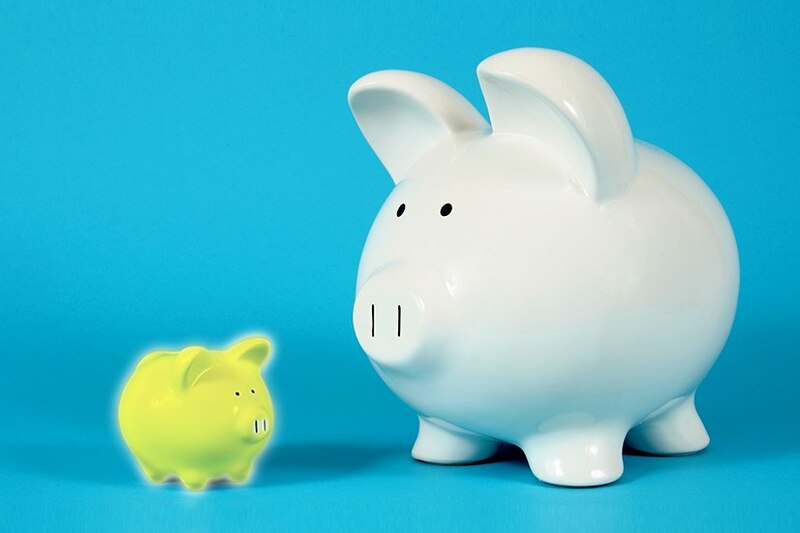 The Financial Health Model ranks a company’s investment worthiness based on the analysis of its balance sheet, cash flow and profit and] loss statement. 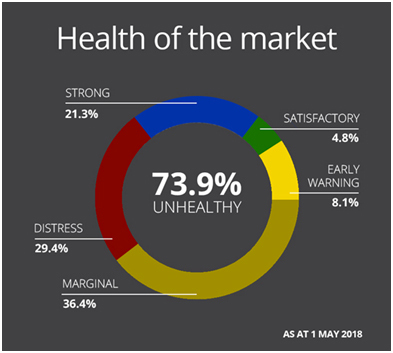 Here’s how the Financial Health of the market looks as of May 2018. The worrying statistic here is that nearly ¾ of ASX stocks (73.9%) are unhealthy i.e. not investment grade. The greater concern is that this ratio increases to 77% for companies with a market capitalisation below $2 billion. This is because many small cap companies are often not yet profitable and are thirsty for capital, which heightens the risks investors are exposed to. This means that if you don’t know which companies are rated as Strong or Satisfactory (the basis of our ‘Star Stock’ recommendations), you have a greater chance of making a poor investment decision. However, despite the risks, the lure of the ‘ten bagger’ will see many investors risk a disproportionate amount of investing in such companies. The harsh reality is that not all fairy tales end in happy endings, particularly when it comes to investing in high risk small cap stocks. If performing the essential task of analysing accounting ratios sounds daunting, don’t worry. We do it for investors every day, PLUS we’ll tell you how to access these ratings for all ASX-listed companies a little later in this article. Management quality and track record are indicators of a company’s ability to fulfil its financial and strategic objectives. If they cannot deliver, then it’s not a smart investment decision to add the company to your portfolio. There are two methods of management assessment: one is for selecting growth stocks and the other is for choosing income stocks. Growth investors need to look at the Return on Assets (ROA) which, for small cap stocks should be more than 14% and on a positive trend. You also need to ensure the Return on Equity (ROE) is 25%+ and on a positive trend and Earnings Per Share (EPS) growth must be over 8% for the past 12 months. Both EPS and revenue growth must also be on a positive trend. Income investors should check if management has achieved consistent and stable earnings in the past, allowing them to pay an above-market yield. They should also have a history of paying dividends. It should be noted that given the concentrated revenue streams and the more volatile nature of share price, it can be a little more difficult for a small cap to make the rank of Star Income Stock, however some do make the grade. This part of analysis identifies if a company is likely to remain financially healthy and profitable in the coming year. It also includes an assessment of any key active risks that might rear their ugly head at any moment. This is particularly important with small cap stocks as, if an active risk becomes real, it could have a massive impact on the company. Our team of research analysts perform in-depth risk assessment into a company’s operations and future opportunities. Our due diligence process is so much more than dissecting data and executing algorithms. It includes discussions with management and industry peers to assess and validate findings. This is tough to do if you’re an investor working on your own without the support of a research team and a whole bunch of specialists by your side. A recent example of our analysts’ insights helping investors was the decision to remove Telstra Corporation Limited (TLS) as a Star Income Stock back in March 2017 at a price of $4.61 on the back of concerns on the looming revenue hole and potential cut to the dividend. Investors without that insight may have held on to TLS shares and experienced its dividend cut of 29% during the August reporting season. It is currently trading at a lower price of $3.25, a 30% decline (as at 09/05/2018). So, seize your 14-day Stock Doctor trial and all our small cap Stars right now.